Another predawn morning and another long tiring day, but totally worth it. 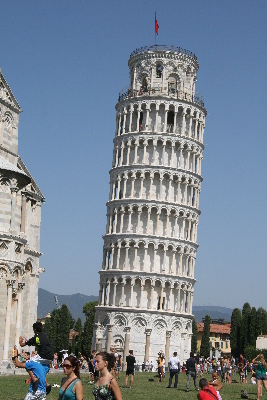 My tour today would take me to Florence and Pisa, including a climb to the top of the famous tower. This turned out to be one of the smallest tour groups, only 18, and we thus we had a smaller bus rather than a full-size motor coach. Our tour guide was a lovely young lady named Tiziana who was very knowledgeable. 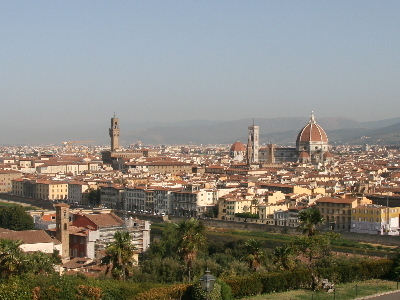 We left around 8 and after negotiating the winding streets in the port we were soon on the expressway to Florence. It was about a 90 minute drive with beautiful scenery along the way. Our first stop was at a hilltop overlook on the southeast side of town. From there we got a preview of the various sights we would visit and saw the first of many replica statues of Michelangelo's David. From there our bus dropped us off downtown where the remainder of the tour would continue on foot. From the drop-off point we walked along several classic narrow Italian streets. 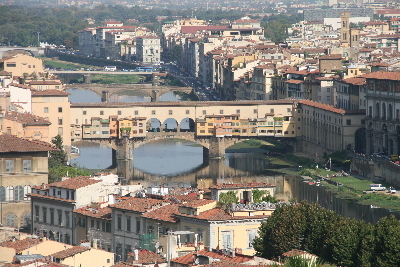 Our first stop was the famous Ponte Vecchio bridge which is lined with shops. Next we headed to Signoria Square where we saw the Uffizi Gallery, the Palazzo Vecchio and another David replica. Tiziana gave us lots of great background on all of the buildings and statues in the square, including some interesting trivia. We walked through the shopping district on the way to our next stop, the Basilica di Santa Maria del Fiore, which is the fourth largest church in Europe. At the time of its completion in 1436 it was by far the largest. 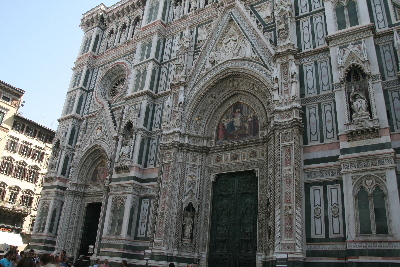 It is completely covered with white, green and red marble and is absolutely stunning. 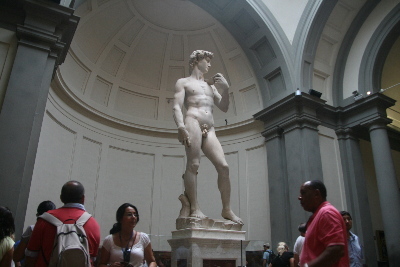 We walked around the church to our last stop which was the Academy of Fine Arts where we got to see the original David along with quite a lot of other statues and paintings by Michelangelo and others. While the replicas are impressive the original is breathtaking. After exiting the museum we had about an hour of free time to do whatever we wanted. 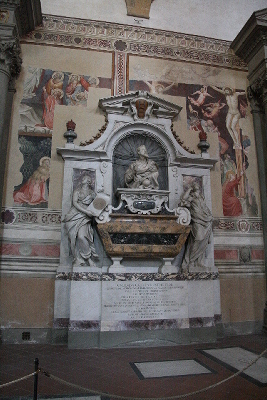 Some shopped and some visited the church but I walked about 20 minutes to the Basilica di Santa Croce, the place where Michelangelo, Galileo and many other famous Italians are buried. It was a gorgeous yet somber place and it was very humbling to be standing among some of the greatest people history has known. A brisk walk got me back to our designated meeting point in time and we were off for the approximately 1 hour drive to Pisa. There was more beautiful scenery as we skirted the base of the mountains. Surprisingly, one of the biggest “industries” in this area is plant nurseries. Thousands of acres of nurseries lined both side of the highway as far as the eye could see with everything from flowers, bushes and other small plants to full-grown trees. 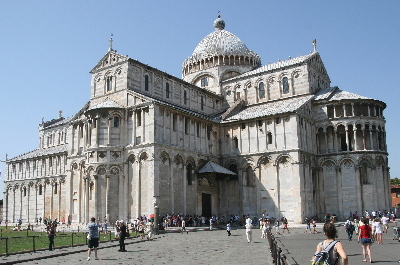 The Leaning Tower of Pisa was the bell tower for the Cathedral. Because the tower is part of a religious site, parking is on the outskirts of town. We walked about ten minutes, stopping to wait for a train along the way; I had no problem with that. We entered the old section of town through the gate in what was the perimeter wall in the Middle Ages and there it was. The Baptistry, the Cathedral and the Tower are all clad in gleaming white marble and the sight takes your breath away at first. The land in this area of Pisa was once underwater and is very sandy. When the tower was started they only got three floors built before it started to tilt. It sat for many years before they decided on another architect to continue construction. The next few floors were built with a small taper to compensate slightly for the lean and the belfry is almost vertical. Scientists have been monitoring the lean for decades and it was moving about 1mm per year. In the 1990's it moved 2mm in 3 months and they decided action needed to be taken. Counterweights were installed, steel bracing was added and the soil was drained to get the tower back to its “correct” lean. Because of those measures, and to prevent further deterioration, only 40 people are allowed to climb at once and tickets are timed appropriately. Our tickets were for 3:45 so we had about a half hour to walk around and take pictures before it was our turn. It was funny to watch so many people trying to take the classic “Look, I'm holding the tower up” pictures. One family did it a little differently, though, as their young gymnast daughter did a hand stand and “supported” the tower with her feet. We met Tiziana at the tower entrance at 3:40 and she had us get in line. Unlike the Academy of Fine Arts we didn't get individual tickets, she had a group ticket for 18 people. When I mentioned that I like to keep my tickets for my scrapbook she gave me the group ticket as a souvenir after it had been scanned. The climb is 254 steps and they are in a continuous circle around the inside of the tower. The rise is rather shallow so it starts out relatively easily. There are two things make the climb difficult, the first being the fact that the steps are marble and somewhat slippery. In addition they are quite worn from centuries of climbers and are not flat. The second thing is that as you go around the tower you go from leaning to your left, to wanting to fall forward, to leaning to the right and then wanting to fall backward. It is very disconcerting as you watch your footing on the slippery steps and attempt to compensate for the lean as it changes. By the way, there are no handrails. 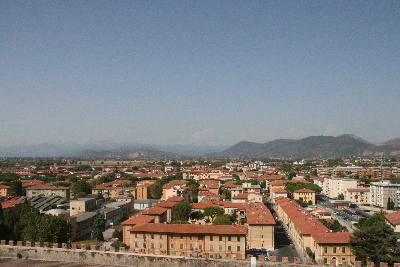 At the top, the view is spectacular with a full 360 degree view of Pisa and the surrounding countryside. Because of the compensation built into the last few floors you don't really feel the lean at the top. You can see the bells hanging slightly out of plumb but not nearly at the angle of the main part of the tower. As if the climb up wasn't treacherous enough, the trip down is downright scary. During the part where you are leaning backwards your feet really want to slide off those slippery steps and several times I almost lost what little traction I had. Remember, there are no handrails so there's nothing to hold onto to, just the two sheer walls on either side. Once safely down our group had about another half hour until we had to be at our meeting point. As I was walking toward some shade who should I run into but Dwight. He had taken a different tour but to the same places, minus the tower climb. We compared notes and then I had to head to my bus. Our relatively short drive back took us past Camp Darby, an American military supply camp. I arrived back at the ship exhausted, as usual. The Peter Corry event for tonight had the Festival Brass performing for everyone on board by the pool. Peter made this an open event to give the performers some exposure to the general public. On the way to my seat I saw Alex sitting near the bandstand in a white gown. I asked her if she was performing and was pleasantly surprised when she said she would be singing two songs. More Alex is always a good thing. Around 9:45 Peter announced the concert and gave a brief introduction for the band. Like our private show earlier, they played a mix of big band and pop with some show tunes thrown in for good measure. Among the crowd favorites were “76 Trombones” and ABBA's “Mama Mia”. Peter sang a few songs during the set and about halfway through he introduced Alex who sang “I Don't Know How to Love Him” from Jesus Christ Superstar. A little later Peter and Alex sang a duet version of “The Prayer”. It was similar to Chloë's version but the lyrics were slightly different and it was, of course, arranged for two singers Both of Alex's performances were amazing (no surprise there) and continued to show the breadth of her talent. 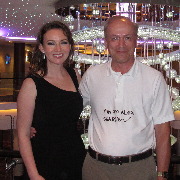 After the show, Alex joined Dwight and me and we had a lovely chat. Alex was traveling with her mom and her son and they joined us as well. Her mom and I hit it off quickly and had quite a few interesting little conversations. Finally Alex had to take Jacob back to put him to bed so we said our goodbyes for the night. Since I didn't have to get up early the next morning, I stayed up for a while to attempt to get caught up on these travelogs; I was now two days behind and I didn't want to make it three. 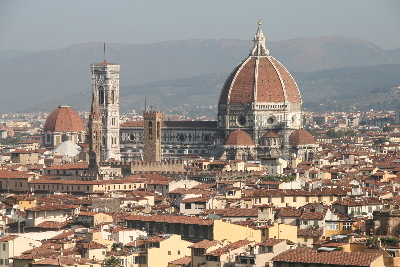 The Basilica di Santa Maria del Fiore towers over the city. 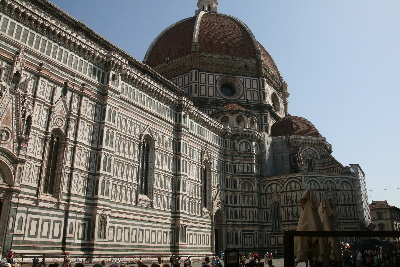 The Basilica di Santa Maria del Fiore up close. 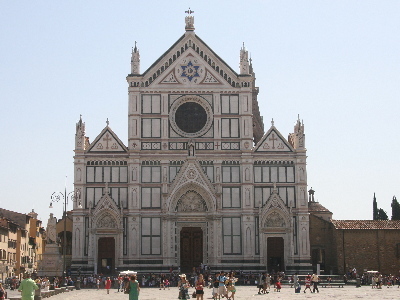 The Basilica di Santa Croce. 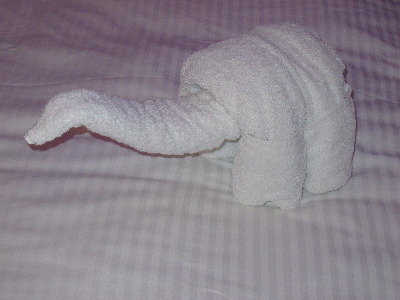 Each day there was a different towel animal on my bed. This was brontosaurus Thursday.